Cosabella was founded in 1983 by Italian husband/wife team Ugo and Valeria Campello. Since then, the Miami-based label has developed a reputation for its seductive, directional and well-crafted lingerie, an exquisite collection which is now accompanied by casual apparel, nightwear and swimwear. The Cosabella nightwear collection features everything from comfy, boyish pyjama shorts to stunning chemises and dressing gowns in silk and satin. Lace trims, rich colours and vintage-inspired details lend a truly exquisite finish to these alluring designs. 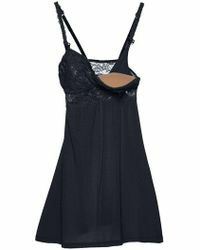 Showing 1,394 results for "Women's Cosabella Nightwear"